Sweden from the Cheap Seats: Waffle Day! 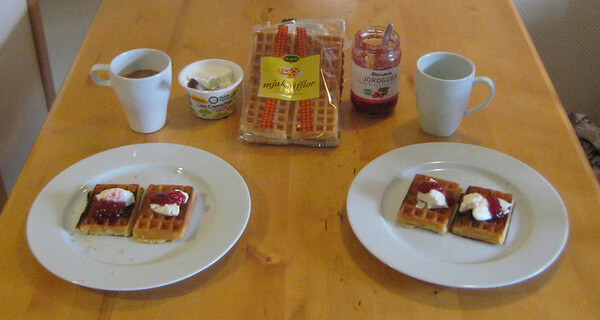 JoeAs if a four day Easter weekend wasn't enough holiday for one week, today Sweden celebrates Waffle Day! Actually, it doesn't have anything to do with Easter, it's just that this year 25 March happens to fall a day after Annandag Påsk. Why waffles? Well, 25 March is the Day of the Virgin Mary in the Catholic Church, or Vår Fru Dag, and the faster you say "Vår Fru Dag," the more it sounds like "Våffel Dag!" So, Swedes celebrate by eating waffles. Pretty much the only indication I saw today that it was Waffle Day was when I was in Clas Ohlson, which is sort of a mid-century department store sort of place—adjustable wrenches, frying pans, lightbulbs, office supplies, alarm clocks. Anyway, they were serving little heart-shaped waffles with ice cream and strawberry jam. Not wanting to miss out on such an important cultural experience, we had waffles and coffee for afternoon snack today. We don't have a waffle iron, so I had to get waffles from the grocery store (fresh, not frozen), along with some lactose free creme fraiche and, of course, strawberry jam. Having celebrated in the finest tradition of Waffle Day, I am left only to ask: how is this different than every other day in Sweden?